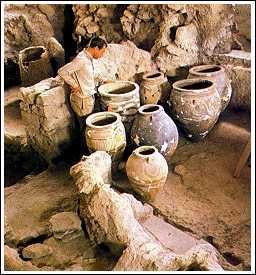 The excavations at Akrotiri began in 1967 by Pro Spyros Marinatos. He chose to excavate there in the hope of verifying a theory which he had formulated some thirty years ago when he was still a young man at the beginning if his career. This theory was borne in Crete when he was digging a Minoan villa at Amnissos, the harbor town of Knossos. While excavating, he was struck by the extent of the violence that must have been responsible for the destruction of the building. He assumed at first that an earthquake was responsible, but subsequent digging brought to light pumice, a volcanic substance. It was then that the idea occurred to him that what destroyed the villa, and in fact the palaces of Minoan Crete, was not a mere earthquake but the eruption of the volcano of Santorini. The eruption would have created huge waves which would not only have hit the coastal sites of Crete, but would undoubtedly have destroyed the fleet as well. In addition, hot ash would have burned the crops. The animals would not have been able to feed, and the whole economy would have collapsed. Spyros Marinatos proceeded to publish his theory "The volcanic destruction of Minoan Crete". At that time, in the 1930's, very few people believed it was true. Thus, he made it his goal to go to Santorini someday and try to excavate there. If he found pottery of the same period as that of the destroyed palaces and villas in Crete, he would have confirmation of his theory. The excavation at Akrotiri were very fruitful. 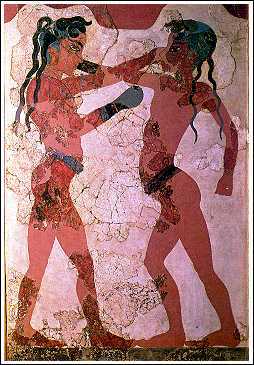 What was discovered was a Minoan Pompey, the only well preserved settlement of the Bronze Age of about 1500bc. The pottery found in the town is almost contemporary with that of Crete. So for many people the theory is vindicated, although not all are convinced. But the importance of the site is far greater than was expected even by the excavator. For the first time we have not only virtually intact walls and houses but whole frescoes, pottery on the places where it was left, furniture, even remnants of food. We can visualize and reconstruct the life of those people of the 16th century BC; we can also tell some things about their relationship with Crete. We can tell that an earthquake preceded the eruption of the volcano. Although we cannot know the exact time interval between the earthquake and the eruption we know that it must have been at least a year. Seeds, which were left on the ruins of the houses, had begun to germinate when the first ash fell. This means that the inhabitants had been forced to abandon their houses well before the volcano erupted. It explains why no skeletons of humans (with the exception of a pig) have been found. What is more, people had the time to collect all their valuables, jewelery, seal stones, most bronzes, even tools. It is clear therefore, that not only they had got plenty of time at their disposal, but that they had organized a mass migration. 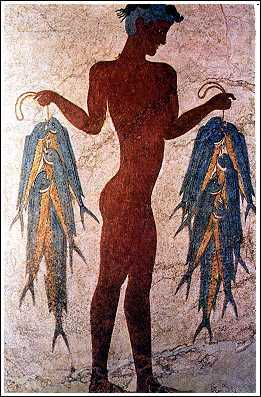 We know that they left Akrotiri, but as of yet, we have no idea where they went. Perhaps we will one day , find evidence of their colony somewhere on the mainland Greece or Crete. The earthquake was very destructive. It is responsible for the ruinous state of the houses that you see on the site. Once ashes from the volcano began falling, the houses were packed so well that they escaped any further damage through the centuries. The question remains though. Why did the people leave? Usually they stay to rebuilt the stricken town. We do not know the answer, but we can speculate that perhaps smoke from the volcano warned them, or the priests had dreams of warning and forced them to leave much like Moses led his people through the desert. It seems however that certain people lingered on in the ruins even after the majority of the population had left. Marinatos called them troglodytes (dwellers in the ruins). Ch Doumas who carried later excavations thought assumed that they were some type of repair team repairing the damaged buildings. These people managed to escape as well because we have not found their skeletons. But we can infer their presence because things were moved around on the ash and the volcanic pumice, a certain testimony that some humans were present at the time of the eruption.